Create an intentional, empowering, liberating, and financially rewarding Transformerpreneur Life Business that serves you as well as your clients. Are you building, or are you serious about starting, a transformation business as any of the following? Are you working hard to create, develop and deliver products and services that transform people's lives? Do you become overwhelmed, confused, frustrated or lost when trying to start, fix or develop your business so that it works consistently and predictably for you, rather than against you, most of the time? Do you sometimes brush your business issues under the carpet, telling yourself to worry about it later? Is this you when it comes to dealing with business numbers, maths, models, money, and finance? • You’re unsure how many of your products and services to sell to survive, thrive, and meet your goals. • You don’t know which of your services makes money and which loses you money in the long run. • You think you and your business are making a profit but not really sure how much, or how little. • You’re not clear what your breakeven point is and what to do to ensure you’re always above it. • You have no reliable way of knowing if something in your business is helping you or hindering you. • Your idea of working to a budget is restricted to doing less of what you want and more of what you don’t. • Your record-keeping starts and stops with tracking how many hits, likes, views, or shares you’ve collected. • You take the best part of a weekend to pull together basic information about your financial position. • You struggle to manage cash flow, leaving it to hope, chance, a wing, and a prayer, to make ends meet. • You get by earning just enough to live an ‘edited version’ of your dream lifestyle. • Your business decisions tend to be short-term, spur-of-the-moment, and rely mainly on your gut instinct. Thankfully, they also serve as a strong foundation platform, grounding and anchoring you to what matters most, during times of inevitable change, upheaval and transition. They remind you of your overarching loving intention and creative direction whenever you’re thrown off course. This is essential when building your business. When up, running, growing, and serving clients, it’s critical. • They lead you toward a healthier, more honest relationship with your work, craft, and business. • They empower you to be more creative so you can expand your business and life with confidence. Without them you’re left in the dark, flying blind, feeling lost, trying to battle your way through the storm. Transform and heal your clients and your business. If you don’t do the work to look after your transformation business as well as you do your clients, you’ll all suffer unnecessarily. You won’t be able to serve yourself or those in need of your service effectively, no matter how well you create and deliver your value. Things can and will go wrong. Clients are encouraged to look to the past, present, and future to determine patterns of thought and feeling that are limiting their enjoyment of life or sabotaging their impact in the world, now, today. You can use the same process to transform and heal your business as well as prevent future ills, or dis-ease. Enjoy more freedom and flexibility to create peace, ease, grace, and flow in your life business. Transform your business to work fully for you and your clients, rather than the other way around, by learning how to read, understand, know, and take responsibility for your business numbers. It’s time to power up your Transformerpreneur Life Business strategy with a new level of financial information, understanding, knowledge, and skill. Whatever state your Transformation Business Life is in sign up today for your individual private and confidential Business Finance Health Check session. You’ll meet for 1 to 2 hours with entrepreneur Richard Conner, CEO founder of Transformerpreneur.com. Now he works closely with Transformerpreneurs, like you, to help minimise their risk of failure and increase their likelihood of short and long term success. His aim is to work together with you to create a sustainable, profitable, and predictable transformation business life platform that releases you to focus fully on what you do best; being creative, telling your story, delivering your message, honing your craft and helping heroes, including you, realise their vision. I’m so grateful for the clarity and value Richard has helped me find with some of the more challenging back-end aspects of my business. With his help, I have been able to implement some key changes and refinements that allow my business to run more efficiently and successfully while helping me to relax more. I now have a bigger picture understanding of how my business works. I know what steps I need to take to move forward with more peace, ease, grace and flow. As a small-business entrepreneur, it can get very overwhelming to manage all aspects of a business. I really appreciate the way Richard is able to sit patiently with me, explain things, and help me organise my information. His support is invaluable. What will my session include? What should I expect? When you sign up you’ll be sent the following to complete prior to booking your session. A short registration and housekeeping questionnaire. A simple spreadsheet template with step-by-step instructions. You’ll only be asked to submit as much detail as you feel comfortable with. All of your information and discussions with Richard will be treated in the strictest confidence. The session will start by reviewing your intention. Next, Richard will run through his Business Finance Fundamentals and Holistic Pricing mini-training. The training will be tailored to your specific needs. Then, using your data with Transformerpreneur.com’s Business Modelling Software you’ll explore in real-time how making only simple adjustments to your business numbers can reveal necessary changes that will help your business start and continue to serve its purpose and you profitably. Click the either button below to view a simple 3 product or a more comprehensive 5 product Transformation Plan example to illustrate what you’ll create with Richard during your session. 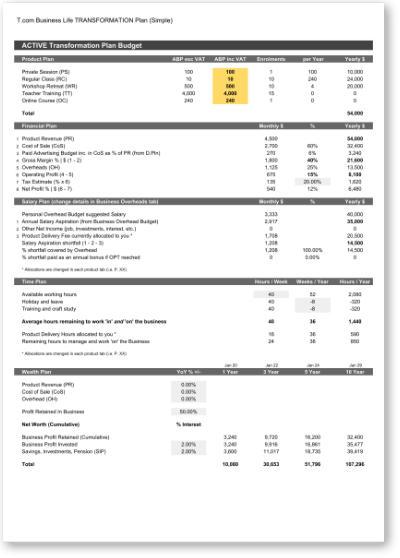 ✓ Bonus 1 | A self-updating Twelve Month Cash Flow Forecast based on the business numbers used in your session to help you understand how your business finances work over time. ✓ Bonus 2 | A comprehensive Product Builder that helps you design, create, and refine your service range’s, costs, profit, and pricing safe in the knowledge that they will work well together financially and contribute to your business success. ✓ Bonus 3 | Your own copy of the easy-to-use Transformerpreneur.com Business Modelling Software that was used in your session. Use it to explore and adjust your business numbers in your own time. Your one-page plan summary will update in real-time. With it you’ll continue gaining valuable insights about your business. ✓ Bonus 4 | The Transformerpreneur.com Twelve Month Cash Flow Forecast, the comprehensive Product Builder, and the Business Modelling Software include email support. ✓ Bonus 5 | The third book in Richard Conner’s Work Life Wide Open Series; ‘Master The Seven Works - Repurpose Your Life : The Holistically Simple Way to Create Conscious Change and Work Your Why. This 325 page ebook breaks down how to unlock and master your time, money, creativity and purpose. You’ll receive your Business Transformation Plan one-page summary and action checklist, your simple Twelve Month Cash Flow Forecast, your comprehensive Product Builder and easy-to-use Business Modelling Software, a list of tools and resources along with suggestions and recommendations for you to continue successfully building your scaffolding, business, and Transformerpreneur lifestyle. ✓ A financial budget that can generate a healthy profit. ✓ Clarity on how you should be pricing your services. ✓ How much time you need to work ‘in’ and ‘on’ your business. ✓ Improved ability to grasp the bigger picture and the detail. ✓ A financial plan to guide your activities for the coming year. ✓ A product builder so you can profitably price your services. ✓ Power to model your business before making any changes. ✓ Visibility on how your decisions will impact your cash flow. ✓ Ways to organise your business and minimise confusion. ✓ Next steps to continue erecting your business scaffolding. How much time and money do I need to invest in my life and business today to start or continue building my business scaffolding the right way? Depending on how available your business numbers are and how up to speed and familiar you are with them you’ll need around an hour to collate the information needed to have a productive, successful, and insightful session. Add to this the 1 to 2 hours for the session itself and you’re looking at 2 to 3 hours of your time to focus on building a stable financial business-self-knowledge platform from which to continue improving and enhancing your business and life. 50% deposit, 50% on completion. Sign up below and you’ll be forwarded to a health check registration page and sent an email with more information about preparing for and booking your session. Your deposit is refundable only if your session is cancelled with at least 24 hours notice. Deposits are non-refundable if you cancel within 24 hours and for no-shows. You can reschedule up to 24 hours prior to your scheduled session, depending on availability, at no charge. Enter your details below today to receive the Transformation Business Finance Health Check questionnaire and session booking information. Please remember to check your inbox, junk, and spam after you sign up.